A missing giant tortoise nicknamed Aboo was returned to its home on Wednesday, proving a good catch for a boy and his father who profited when a western Japan zoo shelled out a 500,000 yen ($4,500) reward. After being on the run since Aug. 1, the 55-kilogram, 1-meter-long female tortoise was discovered in woods near the Shibukawa Animal Park in Okayama Prefecture. The father and son duo, who live in the city of Okayama, went in search of the runaway reptile after hearing that the zoo was offering cash for its return. Seiichi Tonai, 39, and his 15-year-old son, Akira, started their hunt for Aboo on Wednesday afternoon on a hill just 150 meters from the park. 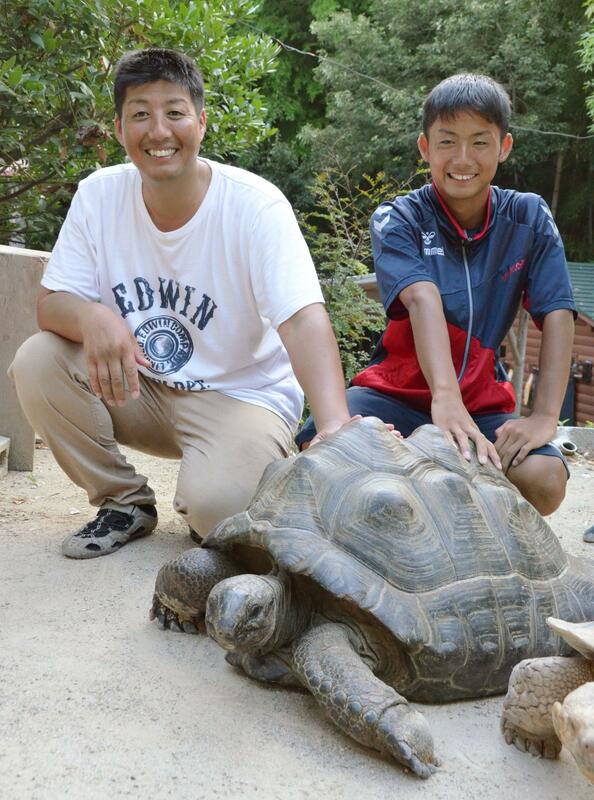 Just 15 minutes into their quest, Seiichi discovered the tortoise and his son quickly informed the zoo. The elder Tonai said he first spotted the tortoise's shell through the undergrowth before noticing it was slowly inching forward. He said he was "glad to see it in good health." Seiichi said he wants to put part of his reward towards feed for Aboo and he will put the rest of the money into his savings. On return to the zoo, the tortoise was found to be unharmed and it proved it by immediately eating a pear and banana. The zoo said the tortoise, estimated to be 30 years old, can survive without food for about a month. The park, which permits some creatures to roam within its confines during opening hours, said it has security camera footage showing the tortoise making a break for freedom through the entrance gate on the morning of Aug. 1. Akira said he cannot believe they found the turtle. "It will be a good memory for me from this summer break," he said. Zoo staff said they did search the area where Tonai and his son found Aboo, but did not find any trace of the refugee. The same tortoise also went missing on July 21 and was later caught on a nearby road. Yoshimi Yamane, a 47-year-old zoo official, pledged the park will now "be stricter in managing its animals."